Over the Holiday weekend, I painted the "Sokolnitz" Castle (a "birdhouse purchased at Michael's for a few dollars earlier this month). 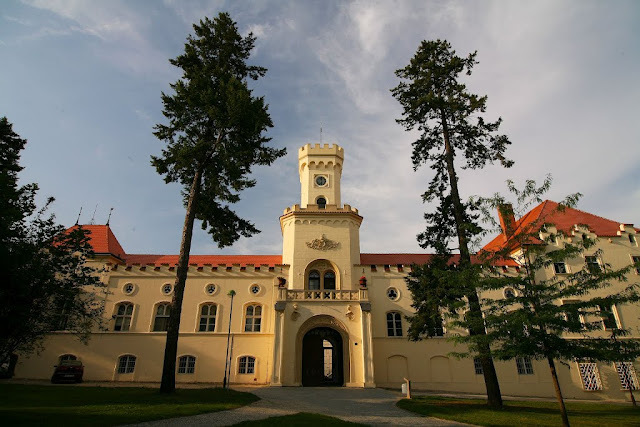 The color scheme is inspired by the actual Sokolnitz castle that was a feature of the Austerlitz battlefield. The birdhouse had "blocks" etched into the wood on the front face only; they are lacking on the other faces. After painting, I outlined the grooves with a brown micron pen on the yellow portions, and black on the brown portions. I considered drawing them in on the other faces, and decided it was too much work for too little benefit. Besides, they don't appear on the Castle (Chateau) being modeled. The final result looks good enough, I think, although in overall style it's sort of a hybrid of Sokolnitz, Neuschwanstein, and Disney! In any event, it's done in time for the Austerlitz battle this Saturday! Here are the second pair of new French Napoleonic Line Infantry wearing the older uniforms and Bicorne prior to the adoption of the shako. It is descended from the Lyonnais Regiment, raised in 1616. The 27e fought at Ulm Eylau, Friedland, Essling, Wagram, Almeida, Lutzen, Dresden, and Waterloo. Of course, most of these figures are actually wearing the fatigue (forage) cap, or bonnet de police. Note the 5th figure from the left with his bicorne strapped to the back of his pack for safe keeping! These little touches made these Old Glory figures in Campaign Dress especially fun to paint. Next up is the 8e Ligne. Descended from Austrasie regiment, which was raised rather late (1776). The 8e fought at Austerlitz, Danzig, Friedland, Vittoria, Essling, Wagram, and Arcis-Aube. Rather out of fashion by the Empire, I have none the less given this unit some very Republican looking tricolor trousers! The blue and red Micron pens came in handy for doing the stripes! Veillons au salut de l'Empire was in fact a revolutionary song composed by Boy-d'Alayrac in 1791. It is derived from an opera created under the old regime, in 1787: "Renaud d'Ast". The tune is that of "Vous qui d’amoureuse aventure" (You who love adventure). Gossec wrote the orchestration of this air in 1792. The revolutionary words were penned by Girey-Dupré. The Empire to which the song refers has no connection with the Imperial regime of Napoleon which would not come into existence for another 13 years. "The Empire" here represents the French Republic and its Sister Republics, the whole of the conquests of Freedom vis-a-vis the monarchies of the continent. With the subsequent establishment of the French Empire under Napoleon, he took advantage of the ambiguity of the title to make this song its unofficial hymn. Although I have been aware of this music since about 1970 (I have an old Nonsuch record of Military Marches, Fanfares, and Choruses from the time of Napoleon, which includes it, and it is also referenced in Chandler as well, IIRC, with the lyrics), I had had not realized that is origins were Revolutionary until doing the background research for this post, despite the lyrics which seemed a bit incongruous for the Napoleonic state! I picked out the tune on the piano from the recorded music, and had occasion to play it on my baritone horn once in college as a celebratory tune while I and the rest of the Marching Band were changing out of our (very Napoleonic styled) uniforms. The Band Director heard it and hazarded a guess as to the source of the tune, naming some popular group I'd never heard of. He was quite surprised when I replied (doubtless with horrid pronunciation of the title) "Veillons au salut de l'Empire, by d'Alarac and Gossec, Hymn of the French Napoleonic Empire." Considering that this was just after the end of the Vietnam War, the Revolutionary lyrics might have been more generally acceptable than the Imperial connection! Tremblez, tyrans, vous allez expier vos forfaits ! We conspire the downfall of kings! Freedom! (repeat) that every mortal pays you homage! Tyrants, tremble! You will atone for your crimes! One of the features of the Austerlitz battlefield was the Sokolnuitz Castle, and the nearby walled Pheasantry. Both saw fierce fighting in the morning of December 2, 1805. 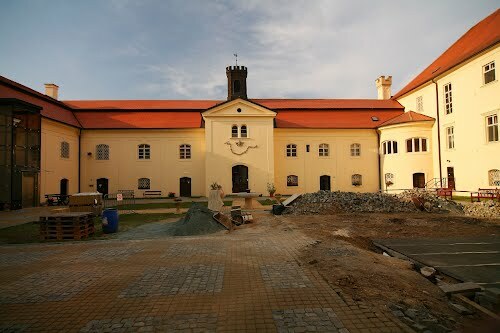 The actual Sokolnitz (Sokolnice in Czech) "castle" is more of a Chateau, based upon a fortified manor house from 1560. Courtyard of the "castle", undergoing renovations. 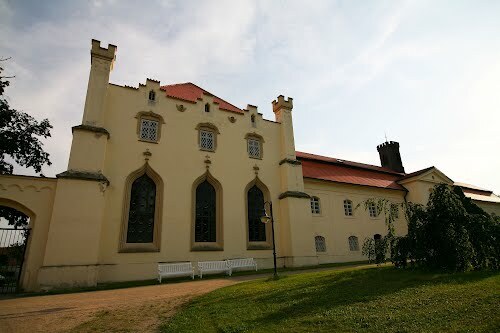 Another view of the "castle" from the outside. View of the back of the "Castle"
Wall of the nearby Pheasantry - the patched areas are said to have been necessitated by the creation of embrasures for French artillery pieces. 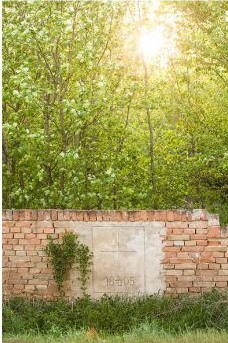 The writing reads 1805 - 2 - 12, date of the battle. Primed are two more "Birdhouse" towers to join the other two "Assyrian" ones I did last year, and the middle one is primed and ready to become "Sokolnitz Castle" for my Austerlitz game in 2 weeks. It will represent the defensive position of the Chateau and the nearby peasantry. The plan is to paint the walls a yellow/Cream color, leave the doors and battlements in the brown Primer color, and do the tops of the towers in red, with black and yellow flags flying from them (Hapsburg colors). Should at least give a fair impression of the original. Micron pens in black, brown, Green, Blue, Dark Blue, and Red. Very handy for fine lines. A number of my Heki trees had become detached from their bases, so I used my "Goop" to re-affix them. Much better. Barry had made up a bunch of the "rocks" for me that we use to indicate lost "Unit Integrity", but I had dragged my feet for a few years painting and flocking the round wooden bases they are on. Task done there as well, once again all ready for the Austerlitz game. For some time I had been feeling that I needed more French Line infantry. It is the one troop type that it always seems there isn't quite enough of in my collection. Sure, I can easily fill in with Italians, Westphalian, Poles and assorted Confederation of the Rhine troops... and I have. I had been considering doing another 'Division" of 4 units with Foundry figures in a pose that I hadn't already used for my existing troops ("loading"), but they're just so darned expensive, even with the post Brexit-vote pound, well over $2 per foot figure. Also, the composition of their command packs and the number of figures in their packs is odd, creating further increased cost due to wasted figures. When I was at Histioricon this July, my long time friend from the Piquet mailing list was once again selling stuff at the flea market. Among the many items that I didn't need was a box of 50 Old Glory French Fusiliers in Bicorne. When Freddie offered them to me for $20, it became decided that the new French Division would be wearing the uniforms of the early Napoleonic Wars, 1804 - 1807. I put them away without inspecting them very closely... until I decided to do the Austerlitz game this December 3rd. Even after paring down the Order of Battle twice, I was still left needing 32 units of French Line, and I have "only" 28 of them. I then recalled these troops, and sorted them out. I found that I had enough figures to make 4 units of 12 fusiliers, including command. I will have to eventually add grenadiers and voltigeurs to bring them up to my usual 18 figure strength, but for this game I will be using 12 figure infantry units anyway to decrease the footprint on the table as well as the time needed to pack, set up, take down, repack, and then unpack them again at home, so this will work out fine for the business at hand. This is the first of the units, designated as the 54e Ligne. The 54e is descended from the Royal Roussillon Regiment, first raised 1657. I had some GMB French 1804 pattern infantry flags on hand, but they were just too big for the Old Glory flagpoles and Eagles. Fortunately, I also had a generous supply of old Signifer flags, and those are what you see here. These figures are listed as being in "campaign dress", and I really enjoyed all the little details the sculptor added to them, as well as the very animated style. Note the frying pans strapped to the packs of the figures in the foreground! I included the two bareheaded figures in this unit; they fit well with the Campaign theme. The next unit of the Division is the 45e Ligne. By the way, the units of the Division are mostly from the Division of Pierre Belon Lapisse, Baron de Sainte-Hélène, which formed part of Victor's I Corps at Friedland in 1807. I couldn't resist the name! It fought at the battles of Austerlitz, Mohrungen, Friedland, Talavera, Dresden, and Waterloo. I gave this unit light buff colored pants, figuring they had replaced their worn out Government issue with some locally liberated items. There is one blank spot left by a "deserter"; that will have to be filled when I purchase and add the Grenadiers and Voltigeurs to the unit next year. I enjoyed painting the older, long tailed coats - it made it much easier to do all the little intricacies of the French Line infantry uniform: white lapels and turn-backs piped red, red collars and cuffs piped white, with dark blue cuff flaps bearing 3 brass buttons, red edging on the pockets, etc.I gave the drum rims a rather Republican flavored tricolor rims. Although these are troops of the early, glory days of the Empire, they look so Republican that I found myself singing La Marseillaise to myself often while painting them. More appropriate would be another song of the French Revolution, Le Chant du Départ. Lyrics as below. The song was made the Anthem of the Empire by Napoleon (not to be confused with the Hymn of the Empire, Veillons au Salut de l'Empire). 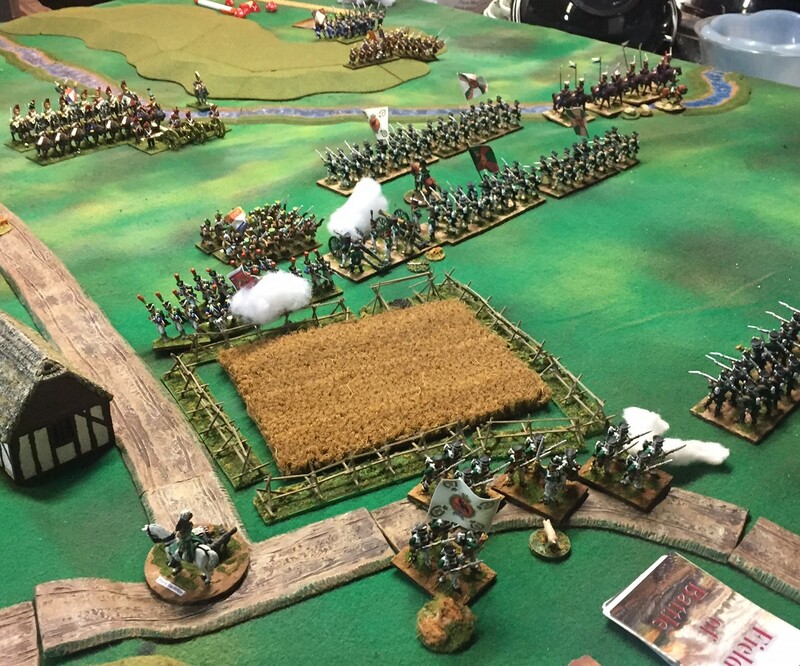 Barry and I got together today for the third battle of our LANNES campaign, this one set in Autumn,1806. View form the West, where the French will deploy. View of Oritango Downs from the Russian Deployment areas (East). And finally a view of the field from the South. One of the four French Commands was delayed; unfortunately, this turned out to be one of my two large Infantry commands. Francois lost the toss and thus had to deploy one of his commands first - he chose the cavalry Brigade of Simeon Souris, better known for his lack of personal bravery than any military talent, and deployed it to the North of the Oritango Forrest. . Boris countered with a Russian Dragoon brigade deployed to their North as well. 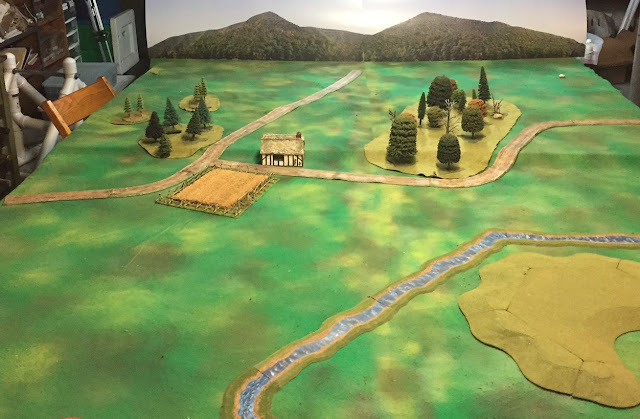 Fancois next deployed his infantry command, heavy with Light Infantry, opposite the woods, and Borris responded with an even larger infantry command of his own deployed across the woods from the. Francois placed his last command, a brigade of mixed cavalry supported by a Horse artillery battery, behind the Southern end of the Woods. His second Infantry command has orders to march with all haste for the gap between the river and the Oritango Forrest. Reports indicated that they would only be delayed about 2 hours; better than it could have been! Boris deployed his second infantry command opposite the river and hill, evidently having some idea of a grand outflanking move. They were supported by a lone Uhlan regiment under the order of General Scardikatsky. View from behind the Russian lines at the start of the action. View from behind the French center. Faucon, with a newly improved Leadership Die of D12 rolled up a Skilled Sequence Deck, whilst Badenov, fittingly, rolled Poor Deck, still having a D10 Leadership Die. Both rolled up 15 Army Morale Points for their forces. Although the French started with the initiative, their first run of cards were all unusable. On the Russian side, though, their forces marched forward very smartly, the lead unit contacting the fringes of the Oritango Forrest. The Southern wing of the Russian forces moved forwards with less self assurance. Some long range Russian Artillery fire pushed the Chaumont Hussars back with losses. Following a bold move into the Forrest by the Russian infantry, the French finally shook themselves out and into action. The refused their right flank cavalry and unlimbered a rather weak 6 lber foot battery to further help protect that flank, whilst dispatching the infantry of Henri Hibou's brigade to contest the woods. Consisting largely of light infantry, shots were exchanged all across the woods. Finally, the Infantry brigade of Rene Renard made a timely appearance to shore up the Southern end of the French position. On the Northern half of the field, one of the French Light units in the woods pulled back voluntarily after suffering heavy (3 UI) losses. The French Artillery, having scored a lucky hit on the Russian Dragoons earlier, saw them shrug off their losses and charge home before the perspiring cannoneers could reload their pieces. The outcome of such a contest was never in real doubt, and the French artillerists were sabered where they stood. That square is looking like a good idea (formed by a rather odd unit of DD10, CD8 Guardsmen!). However, General de Brigade Renard lead his forces forward with aplomb, directing 2 units to cross the shallow liver and seize the Obertango heights. The Russians are getting the better of the fire fight in the Forrest, and have driven back or routed all three of General Hibou's Light infantry units. Seizing the moment, the Bordeaux Chasseurs launch a surprise charge on the Russian Dragoons, after fire from the Russian Horse battery fails to inflict significant damage upon them. In a protracted fight, the Russian Dragoons are destroyed by the Chasseurs. Meanwhile, the Russians evict the last of the French units from the Forrest; the French Center is looking very weak and vulnerable! To take the pressure off the Center, Faucon Directs Renard's men to press forward, a unit of Young Guard in the lead. These troops will win the honors of the day, as they shrugged off both artillery and close range small arms fire, and then force back a Russian Musketeer battalion with their own fire. Although becoming somewhat isolated, they do have both Artillery and Cavalry support to their rear. The second Russian Dragoon unit's attempt to ride down the Chasseurs comes to a bad end, routed with heavy losses. As the dust from the fierce cavalry melee clears, General Souris is down! It seems that his uncharacteristic acts of bravery, which inspired the Chasseurs, have lead to him being hors de combat. On the Southern end of the battlefield, the French infantry on the hill pepper the Russian Uhlans with successive volleys, emptying their saddles gradually. In a maneuver worthy of Senarmont himself, Renard's foot artillery press to within canister range of the Russians, but hold their fire. The French return to contest the woods with some success, but a column attack by the Guards is repulsed with heavy losses, routing them! Back on the Southern end of the Downs, the Young Guard continue to press forwards and fire, routing a Russian battalion. The fire of the French infantry on the hillside similarly routs the Uhlans, and a French infantry column inflicts heavy losses on a Russian battery. With their Morale severely drained, the Russians begin withdrawing. In view of their weak center and the overextended position of some of Renard's troops, General Faucon is content to let them depart without undue harassment. The battle of Oritango Downs is over! [At the end of the battle Faucon had 9 Morale Points left out of 15, whilst Badenov has been down to zero and thus paying them to the French for the past 2 (game) hours].